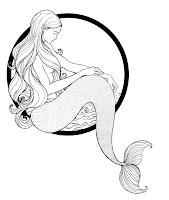 This is my now second commission, this time for a simple line drawing of a mermaid. Here are the two versions I've made for Anthony Nguyen, a really nice guy from USA, who's himself an artist (makeup artist). He wanted his mermaid image based on an antique necklace of his owning, and with the face of one of my older illustrations (sitting princess). I can't find a better description!